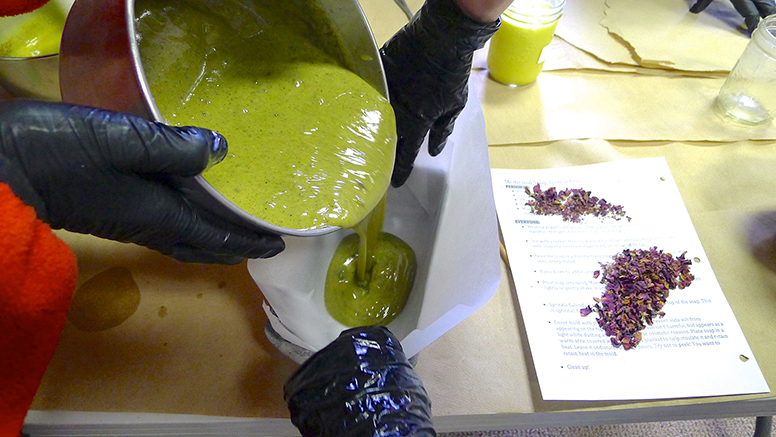 Have you ever been interested in creating your own natural body care products from scratch? The Advanced Herbal Pharmacy course offered at Pacific Rim College provides students with hands-on learning in the preparation of herbal-based products such as shampoo, conditioner, toothpaste, deodorant, soap, and many more. Designed and instructed by Pacific Rim College graduate and medical herbalist, Krista Poulton, topics of study include plant constituent extraction, product preservation, and market regulations to prepare students to formulate, brand, and sell their own products. I enrolled in this class following the wonderful experience I had in its prerequisite, Practical Herbal Pharmacy, which this advanced class builds upon. So far, natural soap making has been a highlight! What is natural medicinal soap? Natural soap or soap from scratch is made from a combination of oils, herbs, and lye (sodium hydroxide). Providing an alternative to conventional body cleansing products, natural soap can be made with as little as five ingredients. Many soaps found at drug stores can contain over 15 ingredients which include various synthetic fragrances and preservatives that are potentially irritating to the skin and harmful for the environment. The herbs used in natural soap making are selected for their colour, smell, and medicinal offerings. Most commonly, herbs that are skin healing, anti-inflammatory, anti-bacterial, or aromatic are chosen. Some examples include calendula (Calendula officinalis), chamomile (Matricaria recutita), and lavender (Lavandula officinalis). 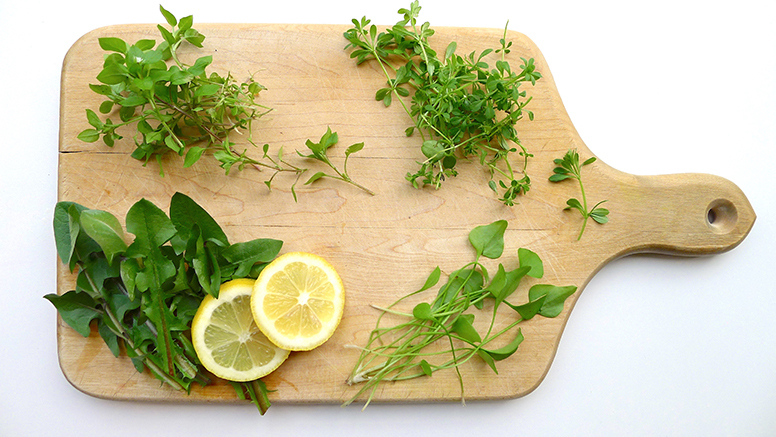 These herbs can be included in a soap recipe infused into oil, powdered, or as essential oils. There are a few different methods for making soap. The hot-process involves cooking the soap, making it ready to use the next day. 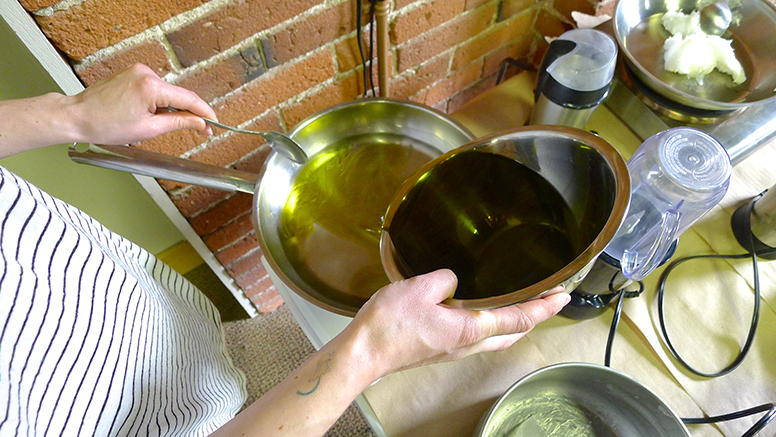 The cold-process shown below only uses heat to incorporate the oils and the soap must then be cured 4-6 weeks before using. All it takes is some basic kitchen equipment, sourcing good raw materials, and a basic understanding of soap chemistry to make your own natural medicinal soap. Soap is created through the process of saponification in which lye (sodium hydroxide) reacts with fatty acids in oil to create negatively-charged, polar molecules. These molecules make soap an emulsifying agent that can trap grease, oil, and dirt to be rinsed away in water. The addition of herbal powders and essential oils help to nourish and protect the skin. Lye is a highly alkaline solution that is necessary for transforming oils into soap. It can be very dangerous in its raw form and needs to be carefully handled with gloves and goggles. Once the process of saponification is complete and the soap is cured for 4-6 weeks, no lye remains and the soap is absolutely safe to use. The soap making process began by gearing up with goggles and masks to prepare the lye by mixing it with water and letting it cool. 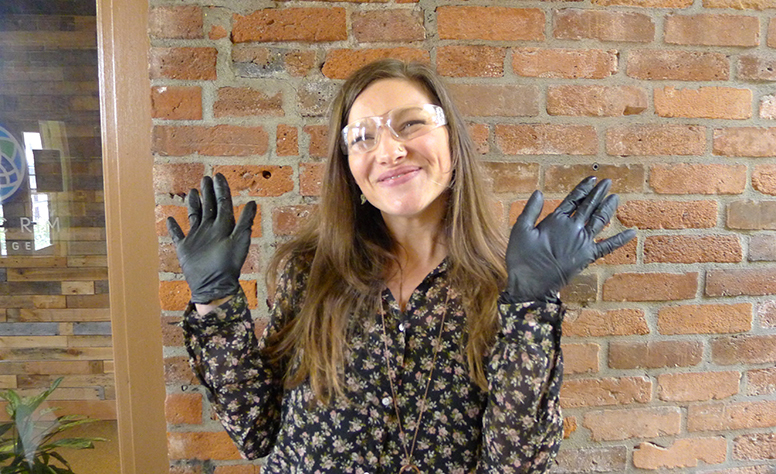 Krista Poulton, instructor of Advanced Herbal Pharmacy and master soap maker. 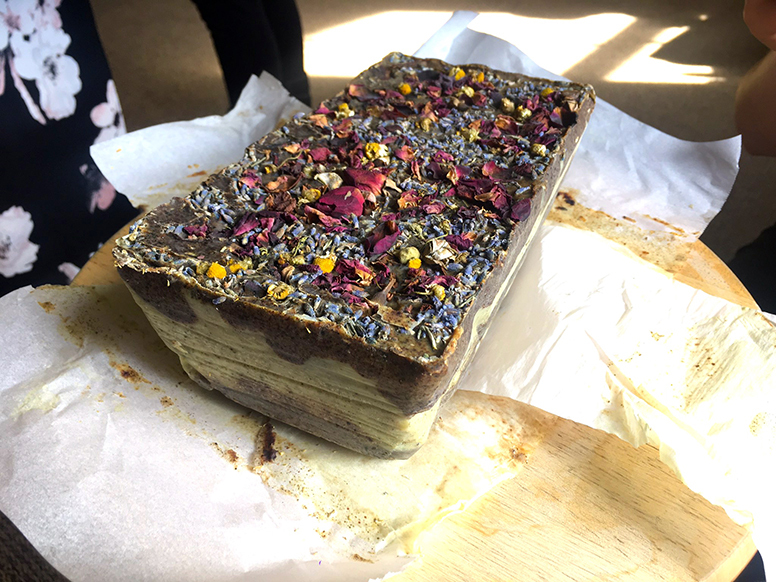 We worked in groups of three to make a brick of soap with herbs and essential oils of our choosing. 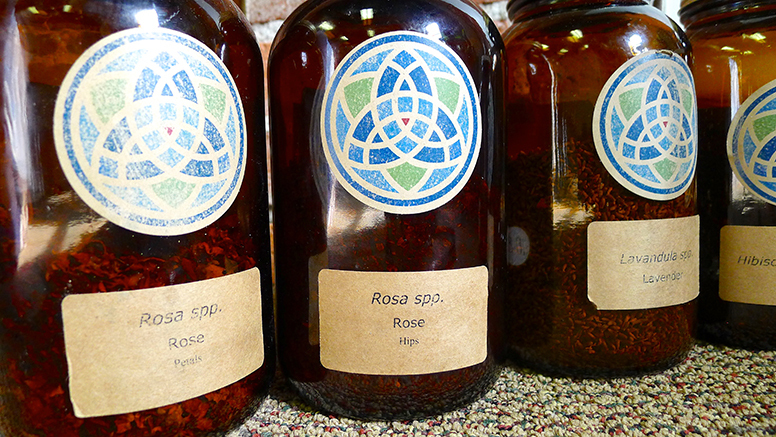 We were able to select any of the dried herbs from the herbal dispensary onsite at the college. Herbs available at the Pacific Rim College Dispensary. 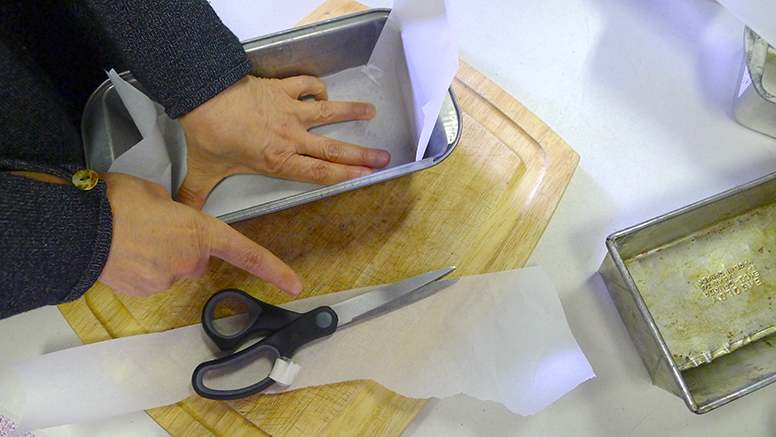 We then prepared the soap molds (baking pans) with parchment paper to prevent the soap from sticking. The coconut oil was melted and mixed with the olive oil. The chosen herbs were powdered to be added to the soap. 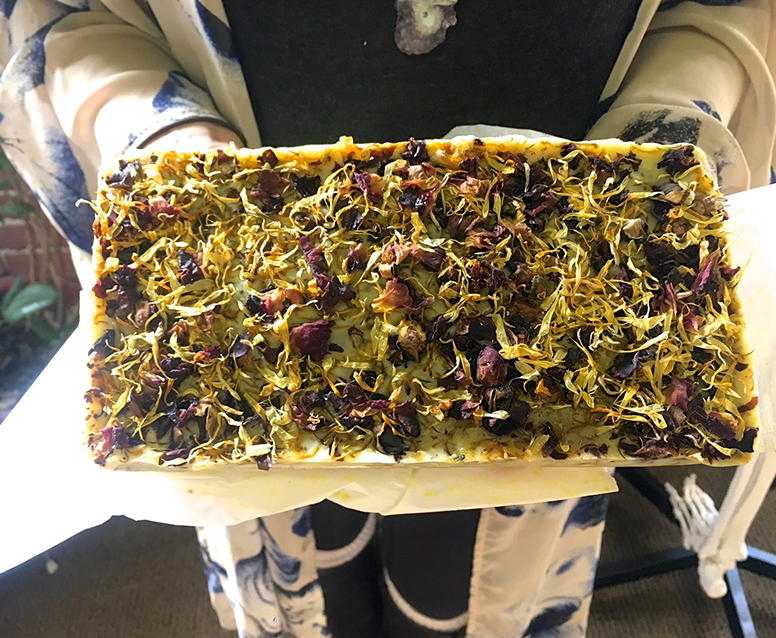 My group chose to make a rose and hibiscus soap with cedarwood essential oil. The cooled lye was then added to the oil mixture and blended until it reached a medium-thick pudding texture. 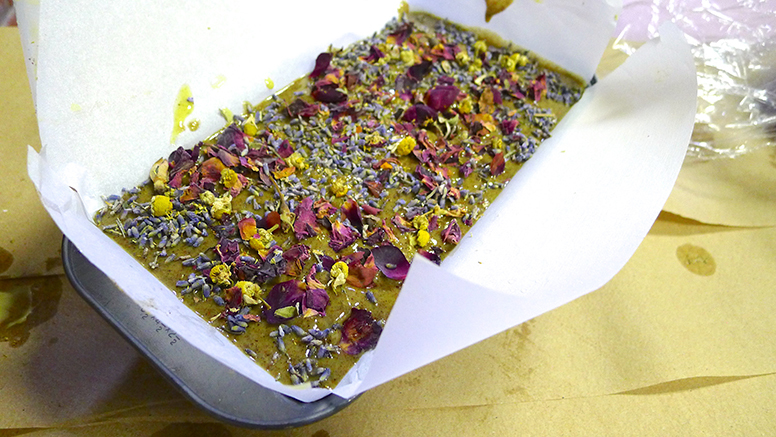 The powdered herbs and essential oils were added to this mixture and then poured into the prepared mold. The soap was then sprinkled with dried flowers and covered with plastic wrap to be kept in a warm, undisturbed place. The next week we returned to uncover the soap and cut it into bars. The bars are now curing for 4-6 weeks and can only be used once the water has evaporated and the lye has completely neutralized. Calendula, rose, sweet orange, and lemongrass soap. Layered lavender, chamomile, and rose soap. 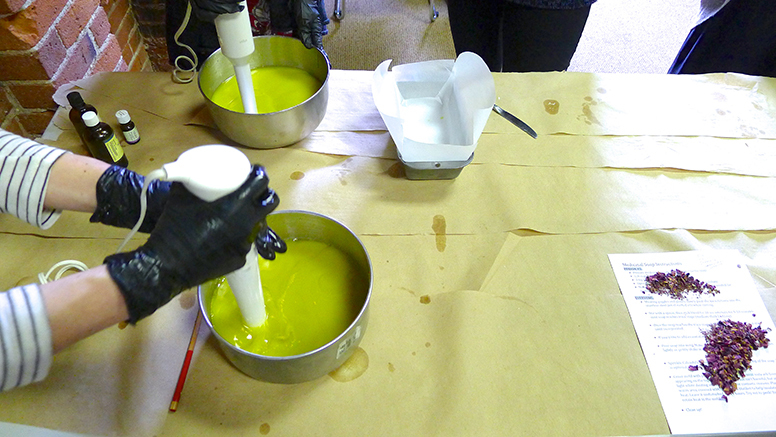 Making soap from scratch is easy, fun, and very rewarding. 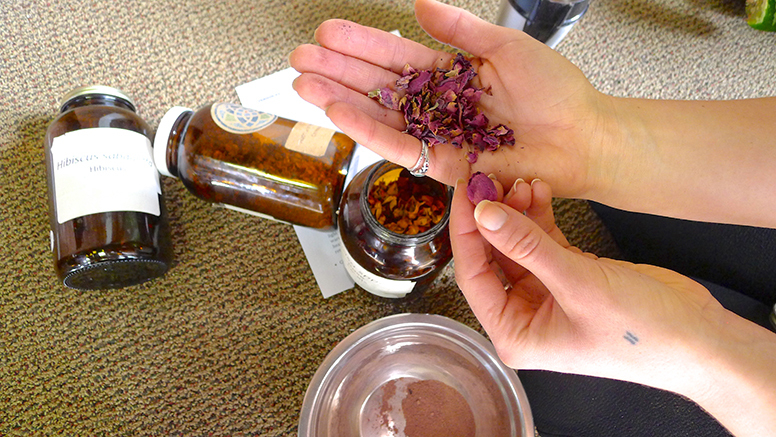 If you are looking for detailed step-by-step instructions, information about ingredient sourcing, and an interactive learning environment, Advanced Herbal Pharmacy may be the class for you! “Medicinal Soap.” Powerpoint. Pacific Rim College, Victoria, British Columbia. Photography and text by Liza Couse, a student in the Diploma of Phytotherapy program at Pacific Rim College. March marks the beginning of spring. As the days become longer and our faces are reacquainted with the sun, energy that was held in the soil during the winter pushes above ground. Vibrant and fresh green growth is all around us offering nourishment and support to cleanse our minds and bodies. 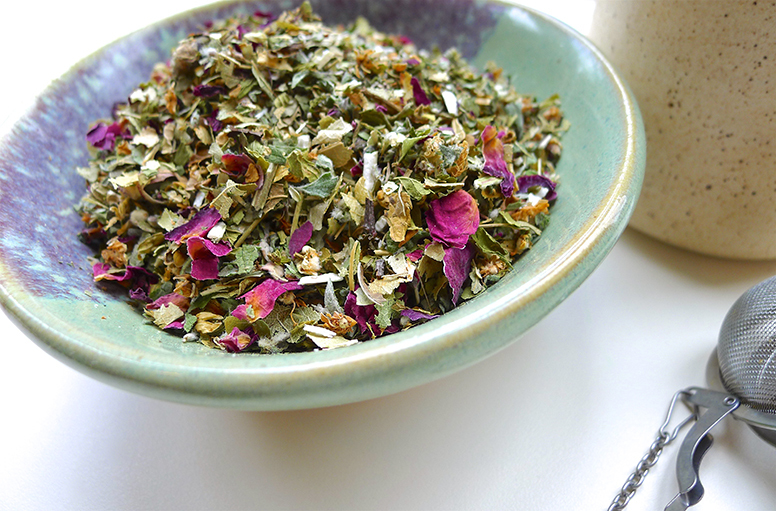 This fresh herb tea blend was inspired by a stroll on a sunny afternoon. At this time of year, chickweed, miner’s lettuce, and cleavers can be found carpeting undisturbed grassy areas and young dandelion greens are never far away. The combination of these local plants makes for an anti-inflammatory, tissue healing, and cleansing herbal tea to celebrate the arrival of spring. Considered a weed to many, dandelion is a herbalist’s delight. The roots, flowers, and leaves can all be used at different times of the year for various ailments. The leaves used in this blend have a diuretic and hepatic action to support the elimination pathways of the kidneys and liver. These tender greens have a mildly bitter flavour that is beneficial for the digestive system and can also be enjoyed in salad and juiced. This annual herb comes up in the springtime and dies back once the temperatures rise. Its delicate aerial parts are very nutritious and make an excellent salad green. It has demulcent and vulnerary properties and thus, it is soothing and restorative for the respiratory and digestive system when taken as food or tea. Chickweed can also be used topically as a poultice or in creams and salves for hot and dry skin conditions. 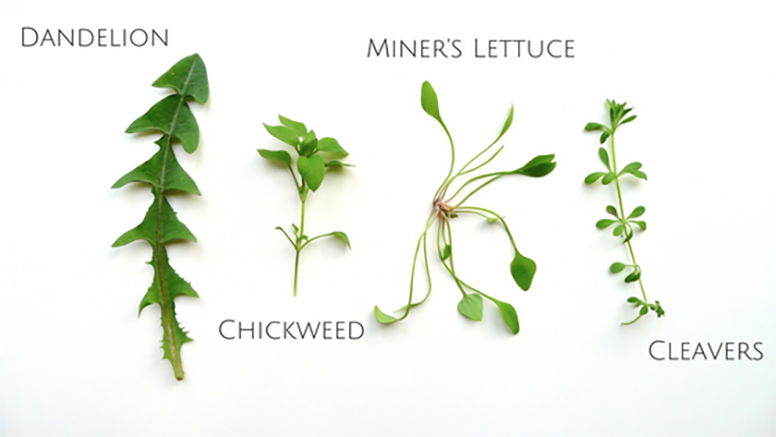 Commonly found in close proximity to chickweed, miner’s lettuce has similar soft green leaves and small pink or white flowers. Containing iron, flavonoids, mucilage, and Vitamin A and C, this plant is nourishing and delicious. The name miner’s lettuce comes from its history of use by California gold rush miners to prevent scurvy. It has diuretic, demulcent, and anti-inflammatory properties. Similar to chickweed, it can be enjoyed as a salad green, used as a poultice, or infused into tea. This native annual is known to cling to anything brushing by it. It is used as a cooling and soothing lymphatic tonic to treat conditions associated with the build up of toxins, including edema, tonsillitis, and eczema. It also has a mild laxative action to flush waste out of the body. Internal spring cleaning! This is a fresh infusion but can also be made with dried herbs. You can make a big batch and store it in the fridge for to 2-3 days. Warm it up whenever needed or use it as a liquid base in smoothies and soups. Ingredients: (Equal parts, about ½ – ¾ cups of chopped fresh herb in total). Pour boiling water on top of the herbs and cover. Let it steep for 15-30 minutes or longer, strain, and add squeeze of lemon. 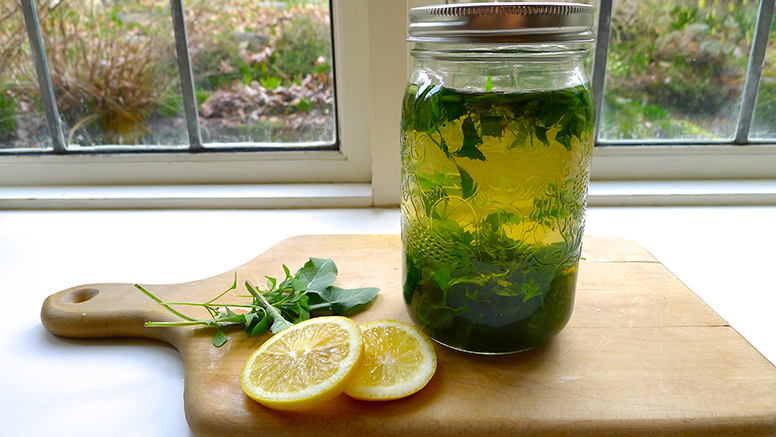 You may alternatively use room temperature water and leave the herbs to infuse overnight. Note of caution: It is very important to harvest plant material from a safe and clean area away from industrial pollution and contaminants. Do not collect plants beside roads, railroad tracks, or in areas that may have been sprayed with pesticides. “Claytonia perfoliata Monograph.” Handout. Pacific Rim College, Victoria, British Columbia. “Galium aparine Monograph” Handout. Pacific Rim College, Victoria, British Columbia. “Stellaria media Monograph.” Handout. Pacific Rim College, Victoria, British Columbia. “Taraxacum officinale Monograph.” Handout. Pacific Rim College, Victoria, British Columbia. 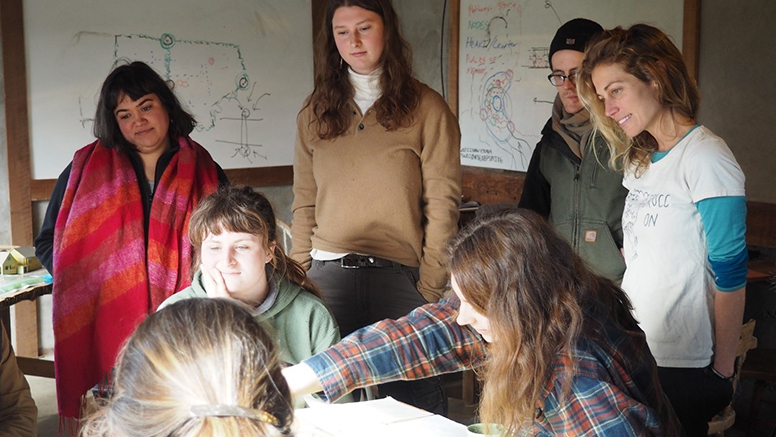 It was a few weeks ago that we spent a day in the city together as a class, exploring sites of urban permaculture around Victoria. Things feel quieter here in the winter, green and tranquil, and much of the life at these places we visited had the sense not of dormancy but of holding firm in a sort of patient repose. I wrote at the time that I was moved “most of all by the sense of community building that informed the design and imbued the spirit of the places we visited” – as if by pausing together we were accessing the gentle eddies of love and energy that was spent in their creation and was still cycling there. This effort is something that I think could be properly called “place-making”. 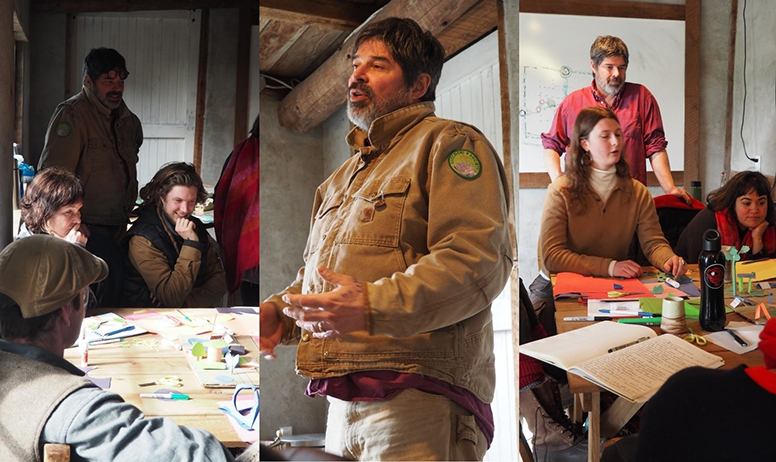 It’s an idea that we explored more deeply this past weekend with Mark Lakeman at a workshop called “Permaculture, Place-Making, and Planet Repair”. I’ll offer some reflections here on Mark’s project and how it relates to ideas of community and regeneration. Mark Lakeman, speaking at center at Ravenhill Herb Farm, cited “From The Heart – Enter into the Journey of Reconciliation” by local Victoria playwright Will Weigler as an example of regenerative “community-based theatre”. The 2013 production examined the relationships between non-indigenous and First Nations peoples in Canada. The set was constructed from repurposed materials, and the majority of the cast was non-actor volunteers. Permaculture has been called a “revolution disguised as gardening”. After listening to Mark, I was struck that his vision of permaculture seems somehow to invert this, so central is the joyful revolutionary spirit of the enterprise. The City Repair Project, which he co-founded in Portland in the mid-‘90s, seeks to revolutionize public space to create a kind of cultural commons – a process that Mark calls “re-villaging”. The “un-villaging” that compels and necessitates this work has political origins. In this country, Canada’s Dominion Land Survey was initiated in 1871, an effort to signal Canadian sovereignty over the western territory by imposing a numbered grid on the land: knife-straight parcels hewn into the prairie map like tiles. Its neat, unyielding uniformity looks like a math equation, terra nullius with no room for argument. It is, of course, fundamentally an expression of colonialism – of claiming and control – for Canada was never terra nullius, and its legacy of Indigenous dispossession cannot be squeezed between these interlocking parcels on the map and made invisible. 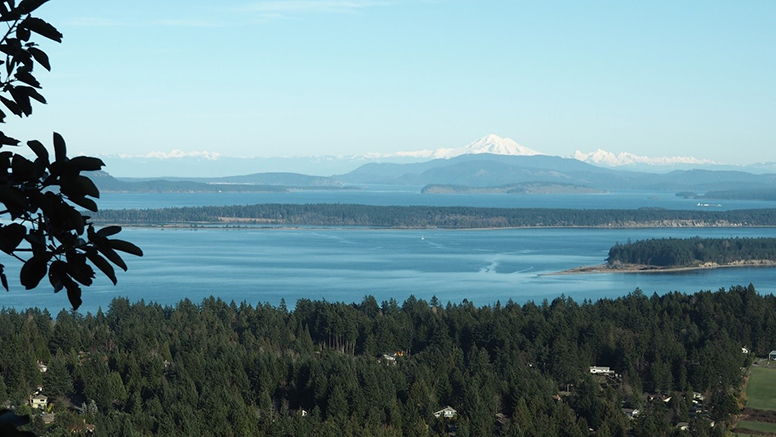 A view of Mount Baker in Washington from ȽÁU,WELṈEW̱, “Place of Refuge”, Saanich Peninsula. But beyond its social and political reverberations, the DLS left another material legacy as well: the criss-crossing street grids of most modern Canadian cities. These square urban patterns, in Mark’s view, serve to tell you that you’re in a colonized place. Certainly, this design isn’t a new phenomenon – the ancient Greek city of Priene incorporated a politically ordained grid plan, despite being situated on a treacherously steep escarpment (an imposed relationship with “edge” that would make any permaculturist shudder). To Mark, it is absurd that we allow overseers to design our environment in this way. And so City Repair, at its core, is an emancipatory project. To decolonize, we need to “garden outside the lines” – to exercise our own authority in the public sphere. What does this look like? The permaculture that Mark talked about is one that elevates the internal and communal aspect: the sometimes half-forgotten culture part of the portmanteau. It is, in his words, a project that aspires to “larger scales of self” – a search for meaningful human culture. And the core principle that permaculture offers us in this search, I think, is the impulse towards a culture of mutuality. Mark suggested that we’ve designed a kind of “anti-permaculture” into our cities and social infrastructure – misogyny, houselessness, inequality – and so we need to try to elicit village behaviour within urban spaces to nurture this missing sense of oneness with each other. Zoning laws and the imperatives of contemporary capitalism have largely forsaken the practice of living and working in the same place, and of connecting with our neighbours. Mark argued that this brings with it a trauma of isolation and creates the conditions for the “tragedy of the commons”. Of course, there are ecological as well as social ramifications to this: if stewardship was hard-wired into our more localized cultures, it suffers now from the growing disconnect. By localizing working and living, Mark’s hope is that we can renew this feeling of place. His efforts to create this environment have been wide-ranging: in addition to co-founding the City Repair Project, Mark is also involved with the Village Building Convergence, an annual placemaking festival; R2DToo (Right To Dream Too), a nonprofit that operates a space for the houseless community in Portland; DePave, an organization that works to create urban green spaces; and Dignity Village Portland, a membership-based shelter. Experimenting with “villaging” changes to a model of Mark’s home neighbourhood in Portland. In his own neighbourhood, beginning in the mid-‘90s, Mark and others explored how to nurture this power of place, beginning in a humble way: a little solar-powered tea-stand, erected in front of an older resident’s house, transformed relationships by bringing beauty and art and design into the equation. As neighbours became more engaged, they discovered that all the necessary materials and skills for transforming the neighbourhood were already present there. More projects – painting the street intersection, constructing the first streetside “tiny library”, collaborating to build gathering places and edible landscapes – brought dynamism and energy to the area. It also brought the ire of local officials. And so this is the challenge: if it’s liberating to “garden outside the lines”, to create an incident in order to generate a reaction, how does one strategically get in trouble in order to change the law? Subversive placemaking can range from the innocuous (ephemeral traffic calming with piles of leaves on the street), to the humorously terroristic-sounding (guerilla gardening, seed bombs). Local regeneration: reeds sticking through the pond ice after an early spring freeze at Tiny Tree Herb Farm. A few things in particular stood out for me: for one, it’s hard for a local municipality to say ‘no’ when the people of the neighbourhood are collectively invested in a project, however unprecedented it might be. This is the power of place. Mark’s localized campaign has led to a slew of policy changes in Portland, opening the doors for other neighbourhoods to undertake similar efforts – most recently, the city approved the installation of raised garden beds on any city boulevard, creating the potential for 6000 miles of neighbourhood food production in the city. Strong neighbourhoods inspire replication – Mark’s local uprising prompted other communities to follow suit, building what Mark calls “particles of health” in the city. Especially instructive, I think, is Mark’s example of kind and inclusive activism. When confronted by city bureaucrats, the neighbourhood approached it as a chance to show them that they could be creative in their jobs, as well. Local NIMBYism, itself a sort of pride of place, is a beautiful energy that can be harnessed respectfully for productive ends. Thinking of my own experiences at the School of Permaculture Design at Pacific Rim College, and my own front-row seat to the rapid changes in my local Fernwood neighbourhood in Victoria, I’m heartened by the knowledge that I am surrounded here by all the skills and resources to create a community that invites creative, loving giving and sharing. And based on our shared experience this weekend, it’s a sparkling kind of energy that can spread and can lift us all up. Words and photos by Dylan Roberts, a student in the Permaculture Design and Resilient Ecosystems Diploma at Pacific Rim College. A discussion with Vanessa Brown about her doula practice, health philosophy, and her experience as a student at Pacific Rim College. 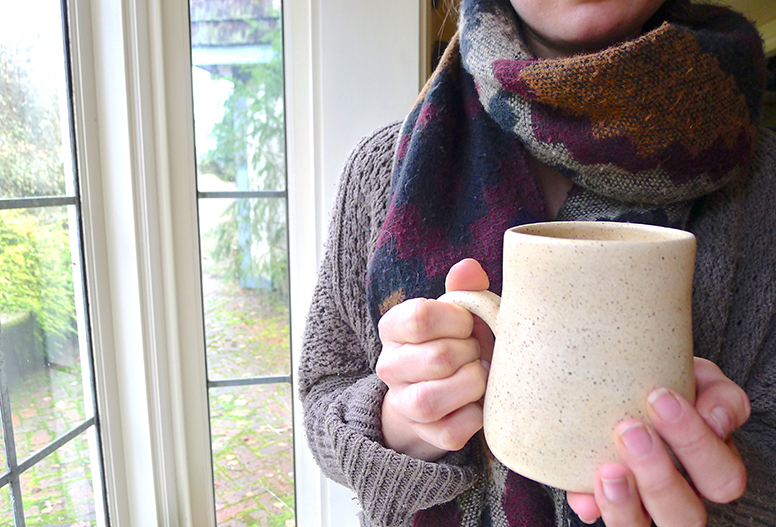 We sat down for a cup of herbal tea with Vanessa Brown, a holistic doula in Victoria who is a graduate of the Pacific Rim College Holistic Doula Certificate program. 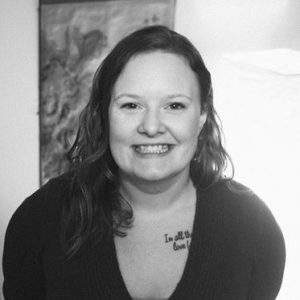 Vanessa has over 300 hours of training and over seven years of experience supporting families through pregnancy, childbirth, and into the early days of parenthood. As the vibrant force behind Farfalla Wellness, Vanessa offers holistic doula care and prenatal yoga. Vanessa provided insight into her doula practice, her experience at Pacific Rim College, and much more! What is a doula and what role do they play in the progression of pregnancy? VB: I like to use an analogy of a swim race to explain what a doula is. Imagine a swim race. The swimmer represents the birthing person, the swim coach is the doula, and the life guard is the doctor or midwife. The swim coach is there to prepare the swimmer for the race (birth) then cheers them on the whole time, all while the life guard oversees the event to make sure everything is safe. Post race, the coach supports the swimmer with healing and recovery (postpartum). Doulas aren’t there for safety precautions or to provide medical care but they take care of all other important things. What was it that drew you towards holistic health care? VB: A book titled, Half the Sky by Nicholas Kristof. The title comes from the Chinese proverb, “women hold up half the sky.” The book is about women in difficult situations all over the world and how they rise above oppression and thrive to support their communities. The book spoke to a lot of different care providers and their roles in various situations and it greatly inspired me. At the time of reading it, I was working in retail as a visual merchandiser and I made things look pretty but wasn’t really making a difference. I started looking into what roles I could volunteer with. I looked into nursing, and then I found midwifery, and then I discovered that I could become a doula. How did you choose the Holistic Doula Certificate program at Pacific Rim College? VB: I completed doula training before attending Pacific Rim College and it was good. It gave me a solid idea of what to expect in this career but I did not feel confident in my skills or abilities. After my training, I volunteered for births and worked in multiple communities. Following that, I wanted to add more skills to my tool belt and I found Pacific Rim College. I was considering the Holistic Nutrition or Herbal Medicine program but then the Holistic Doula Certificate program became available and so I enrolled in that instead! It was wonderful and now I feel a lot more confident and a lot more capable. Plus, it included business training, which a lot of programs miss out on. I really admired that the instructors were working in their field as they were teaching us. They had very relevant case studies to bring to the table. VB: Doulas work for families and not the government or a governing body. Therefore, as a doula I can do whatever the family wants and needs of me. The roles of a doula and a midwife do cross over in ways. We are both family-centered, women-centered, and we believe in a whole person wellness based direction of care. The difference is that midwives are primary healthcare providers just like a family doctor or a general practitioner. They can perform medical tests and take care of the medical side of things. Doulas fill in the gaps. Our health care system is blessed in ways. We have a lot of options, but the system is overrun and those within it are over-worked. I’ve been in many labour and delivery situations in which the nurses are so busy that they’ve left my clients for long periods of time, checking in when they can, but if I weren’t there my clients would be navigating labour alone. As I said, doulas fill in the gaps. We are there from start to finish throughout the birth. Many people expect their nurse or midwife to be there supporting them throughout the entire process, but sometimes that’s just not the reality. They’re just way too busy. Who can benefit from having a doula to work with and who are your clients? VB: Anyone! I’ve helped a lot of different people in various family dynamics. I’ve supported single mothers, big families with ten people at a birth, low income and high income clients. I think it’s more about a person’s needs and expectations than who they are. I commonly see that most people hire me for their second birth. Maybe their first birth was traumatic or didn’t go according to plan. Maybe they didn’t feel respected or heard, and now they want more control. Doulas are present for the entire process of birth and postpartum. We don’t change shifts, we are there from start to finish. We build sincere and meaningful relationships prenatally and into postpartum, which can be very vulnerable time. We don’t take our place in the sacredness of this process for granted. I find that my clients are people who value this and want it as a part of their experience. As doulas, we are unbiased. I use natural tools but that doesn’t mean I won’t support someone who wants all the bells and whistles available at the hospital. People commonly assume that they need to have a home birth or a completely natural birth to hire a doula but that’s not the case. I’ve been to planned caesareans. Doulas can support any type of birth plan. Why do you avoid using the term due date? VB: Babies aren’t due. The term due date implies that if babies don’t arrive on the specific date there is something wrong. I like to call it a guess date or a guess month, babies can come at a wide range of dates. Most people expect babies to come at 40 weeks but on average first babies come around 41 weeks. In your opinion, what are the core pillars of holistic health? 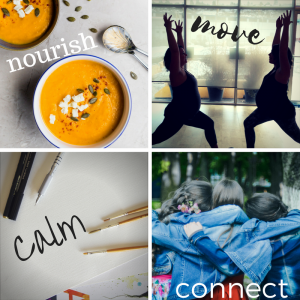 Nourishment: nourishing the body with thoughts, food, and the energy of their surrounding environment. Movement: moving and connecting to the body. Calm: cultivating calm through art, expression, and relationships. Connection: with the baby, community, building a village of support. What is a top memory of the Holistic Doula Certificate program at Pacific Rim College? VB: My classmates and I became a sisterhood and a family very quickly. It was a very vulnerable thing we were studying. We did a lot of self-work and reflection throughout the program, and there was a lot of support. It was a very intimate experience. What are you working towards with your doula practice? VB: My goal is to become a full-time doula and to incorporate more yoga into my practice. I completed the prenatal yoga teacher training through Semperviva in Vancouver and that was life changing for me, it was a very eye opening training. It was a prenatal education through a yogic lens. It really resonated. I’ve been incorporating the training into my work with a few clients and it’s going really well. *Vanessa just hosted a prenatal wellness yoga workshop and she is working on setting up weekly yoga in Victoria next month! She currently offers private prenatal yoga classes. Do you have any reading recommendations on the topic of pregnancy and childbirth? Any final things you would like to share? VB: I want to share that birth can look different for each person. Birth can be beautiful, life changing, and transformative. It doesn’t have to be a scary thing. It’s something you will always remember: how you felt, how you were treated, the first time you touched your baby. These things need to be valued for a baby to have its best start the world. Ina May said, “whenever and however you give birth, your experience will impact your emotions, your mind, your body, and your spirit for the rest of your life.” Doulas are here to support this process every step of the way. Do you have more questions for Vanessa about her work as a doula or her experience at Pacific Rim College? She would love to chat with you. She can be contacted at farfallawell@gmail.com. This interview was conducted and condensed by Liza Couse who is enrolled in the Diploma of Phytotherapy program at Pacific Rim College. This week, while spring started nudging colours up from the ground, and as cherry and plum blossoms unfurled overhead and sounded the timid first notes of what will grow to be a symphony of pinks and whites in the city, we sat down at the farm to learn about perennial plants. Solara, our instructor for this course, is from the local design and edible landscaping firm Hatchet & Seed. She began the day by asking us to think about memories from childhood that involve perennial food. Easy, right? Food is evocative – carrying deep cultural meaning, playing to all five of our senses, a kind of interior lodestar marking the ritual and rhythm of life. The smell of food, in particular, is closely associated with autobiographical memory, as our olfactory bulb has direct connections to the brain’s amygdala and hippocampus. And so food bridges that space between the personal and the communal, a form imbued with a shared universal meaning. Curious goats and a taciturn dog at Ravenhill Herb Farm. I’m of Mennonite extraction on my mom’s side, and so I was already mentally licking my lips in anticipation of the exercise. I jotted some historical context into my notebook. Winnipeg, where I grew up, has a sizeable Mennonite population – in the 1870s, ethnic and socio-political pressures in the former Russian Empire sent a third of that country’s Mennonite population fleeing to Canada, many of them to Southern Manitoba. Later waves arrived in the Canadian prairies in the 1920s, in the wake of the Bolshevik Revolution, and again during the Second World War. Many of these settlers began farming the fertile soil of Manitoba’s Red River Valley and elsewhere. But farming what? Perennials? I realized that I didn’t know enough about farming, or perennials, or, I guess, that part of my family history to say for sure. And Sam, sitting next to me, was almost finished answering. Growing up, I remembered eating traditional Mennonite food: vareniki (perogies), or else cottage cheese pancakes, both tasting vaguely like yummy contraband as they were served when my dad wasn’t home for dinner (he didn’t like them). But no perennials in there. What else? Borscht? Scalloped potatoes? I chewed on my pen cap. Then I hit on it. Lunch around the fireplace at Ravenhill Herb Farm. Eventually, plumbing the depths of my childhood mind, I remembered watching a rhubarb eating contest at a “pioneer” festival in rural Manitoba. The stalks were burly and bright, eaten raw – no sugar allowed. It was tense. A baby won. And I realized a couple of things, as I think Solara intended. One is that I hadn’t thought about food in these terms before, that is, as being annual or perennial. I had lots of other mental systems of classification, for use at the grocery store or farmer’s market: if it was local, if it was in season, if it appeared on the “dirty dozen” list for conventional produce. If it tasted good. But obviously I was at some remove from the cycles of the food I was eating. My other realization was that, outside of fruits and nuts, we don’t have a whole lot of common perennial crops here. Early Eurasian agriculture centered around livestock, annual grains and legumes – in Guns, Germs and Steel Jared Diamond traces its regional development through the winter rains and summer droughts of the Mediterranean, to its subsequent spread northward, where cooler temperatures and a shorter growing season privileged the quick rewards of annual production. Settlers to the prairies brought along these annual seeds and draft animals for tilling. But perennials have their advantages: whereas tilling releases carbon stores in the soil, perennial plants sequester it in the ground. Perennials generally possess greater nutrient density and drought resistance, provide stable yields, and require low energy inputs. Farming culture in Central and South America is more oriented towards perennial crops, but the North American palate is not well-accustomed to the assertiveness of many of these tastes. We took a walk around the farm to scout for some perennial plants. 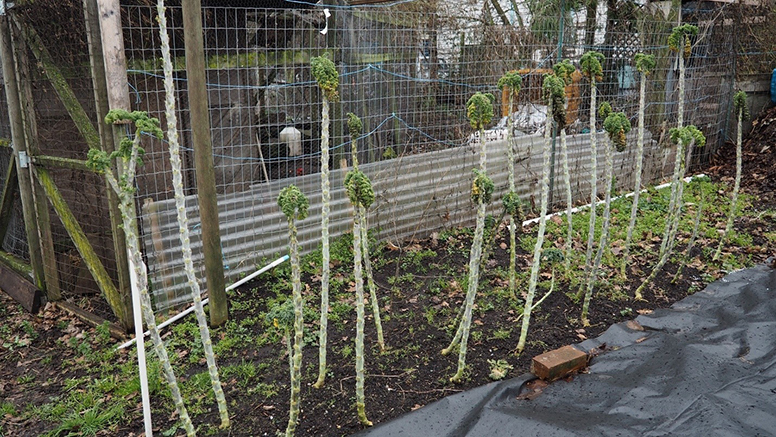 Solara pointed out a hops vine snaking up the side of the classroom – its flowers here in the Pacific Northwest lend the uniquely fruity, resinous character to many craft beers, and its young shoots are edible, a bit like asparagus. Creeping thyme and hanging rosemary hung pendulously over the rock wall on the side of our path. We walked past a quince tree and came to kneel at a garden patch thick with cardoon, a wild cousin of artichoke and a “dynamic accumulator” that mines minerals from deep in the soil and makes them available to more shallow-rooted plants. Nearby was some tousled-looking lovage, a medicinal herb that’s prized for getting rid of tent caterpillars in the garden and that also serves as an excellent compost accelerant. On the garden’s edge was allium, wild onion, the whole plant edible and delicious. It attracts pollinators and is supposed to be a great performer on green roofs, acting as a fire suppressant and cooling the house in summer. As we walked, Solara took some cuttings of these plants for us to propagate at the end of the day. Having a wide variety of species in the garden helps to mitigate the effects of weather and pests, and safeguards from the unforeseen – as Toby Hemenway phrases it, “redundancy protects when one or more elements fail”. Taken further, the idea of a permaculture guild asks that this diversity be mutually supportive: more than the plant pairs and trios of companion planting, a guild seeks to develop gardens as self-sustaining polycultures. So let’s envision native perennials centered in this equation – the result might look something like an edible forest garden. One of the challenges of perennial growing is the need to adjust to longer-term thinking. Since perennial plants will be sticking around awhile, decisions about their spacing and location take on more weight. Toby Hemenway sees trees, the “aristocrats of the plant world” as major actors in this system, one that admittedly begins to look less like the sort of “garden” that we’re mostly used to. It is instead one that is regenerative, that would be continually building soil, plant, and ecosystem health. Working to fold my cuttings into the soil under the slanting late-afternoon sun, this vision seems some distance away. But even though the cuttings are small, they are vibrant, and I know we’re on the way. Cuttings taken during our Perennial Plants class. The plant produced from a cutting has the same genetic maturity does the parent plant. If a plant takes several years to produce fruit when grown from seed, a plant grown from a mature cutting can fruit that same year. 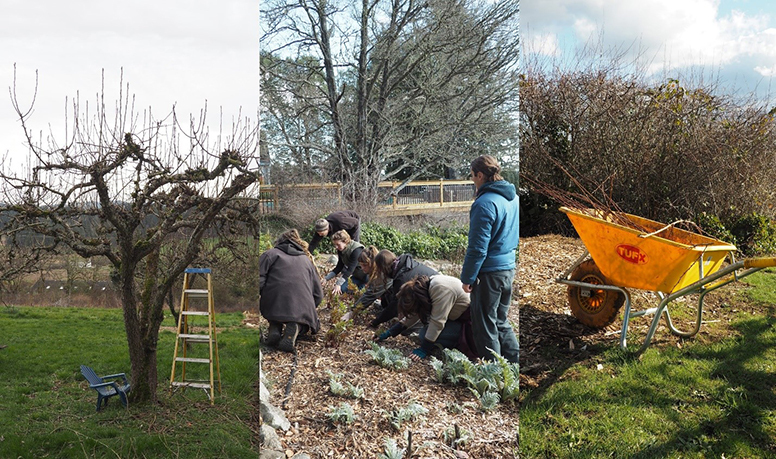 We planted some hardwood cuttings an adjacent planter – propagating fruit trees such as figs, mulberries, and quince. When I was a few years younger – well, when I was in elementary school – I would draw blueprints of the houses I planned on living in when I grew up. Some looked like your garden variety mansions, opulent and symmetrical, towering Versailles gingerbread houses that now make me wince a bit. Others were more avant-garde, tottering and bizarre (and definitely not to code), equal parts The Once-ler’s house and James’ peach. But the best marriage of my dualling desires for genteel luxury and radical experimentation, my elementary school self eventually surmised, was probably something like Big Ears’ house. A well-appointed two-storey toadstool loft would be both fashionable and functional, and with all the attendant benefits of a pleasant rural forest neighbourhood to boot. 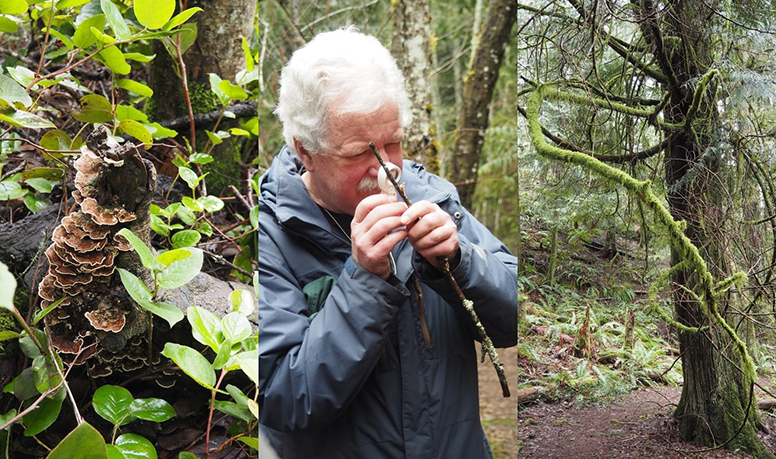 (L-R): Saprophytic fungus growing on a decaying stump; mycologist Andy MacKinnon examining lichen species under a hand lens; Isothecium stoloniferum moss in 100 Acre Wood, Metchosin. Fastforward a decade or two, and I find myself at the trailhead to just such a pleasant forest, this one in Metchosin, waiting for a mushroom man. Andy MacKinnon is a forest ecologist and mycologist, co-author of six books on related subjects that together have sold over half a million copies – unsurprisingly, he’s been called a local “rock star”. We’re on a botany class field trip to learn about the role of fungus in our local ecosystem, and it sounds like we’ve found the right guy. After a few minutes, MacKinnon arrives, trailed by an energetic truffle hound*. He explains that he’s been ensnared in a long-term dogsitting arrangement, and that Piper, who by this time has bounded across the road and is barking frantically at an impassive cow in the neighbouring field, needs a walk and will be tagging along. 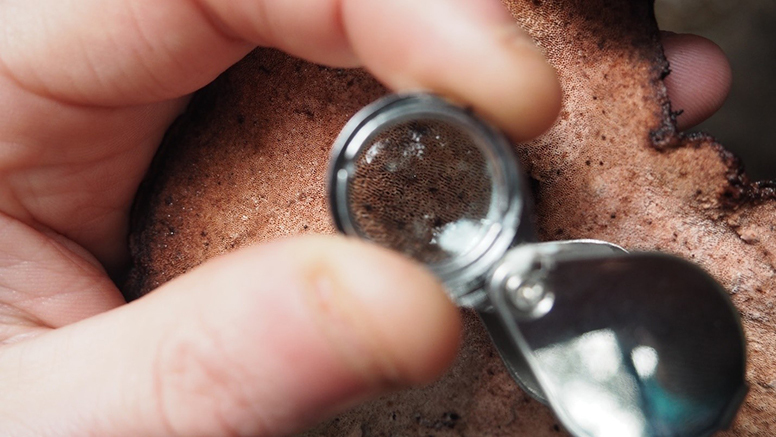 Using a hand lens to examine pores on the underside of a Fomitopsis cajanderi (rosy conk). Before we set off into Metchosin Nature Park (which, in keeping with the children’s lit theme so far, is nicknamed 100 Acre Wood by locals), MacKinnon talks briefly about his career with the province’s forest research branch. He’s worked in developing BC’s Biogeoclimatic Ecosystem Classification system (BEC), a method of assessment that integrates analysis of the biology (vegetation), geology (soil), and climate of a place in order to identify its different ecosystems. British Columbia has sixteen classified biogeoclimatic zones, and a multitude of sub-zones; MacKinnon tells us that we’re currently standing in “Coastal Douglas-fir – Moist Maritime (CDFmm)”, an area that includes the city of Victoria, and just straddling the fringe of “Coastal Western Hemlock – Very Dry Maritime – Eastern (CWHxm1)”. Mapping these zones through the observation of “indicator species” allows for precise and comprehensive differentiation between ecosystems, yielding data that would require an impossibly dense network of climate stations to map. Lichen specimens on a branch. Recent discoveries suggest that both ascomycete and basidiomycete fungi live together with an algae or cyanobacterium to create the symbiosis that forms these lichen. It’s not the best time of year to find visible fungi, MacKinnon says, and I quietly give up my hope of finding a Big Ears-sized toadstool on the hike. Mushrooms are the fruiting bodies of fungal networks – tucked beneath the ground, or within their food source, seeking to reproduce – and so many appear through the summer and into the fall here when conditions are drier and friendlier to spore disbursal. It is mainly the saprophytic variety that we’ll observe today, those fungi that grow on dead or decaying organic material, like the rotting logs scattered damp and heavy through the forest. If mushrooms are scarce, though, something else is visibly abundant: the lichen that everywhere drape the rocks in vibrant shawls and drip from tree branches with Seussian extravagance. 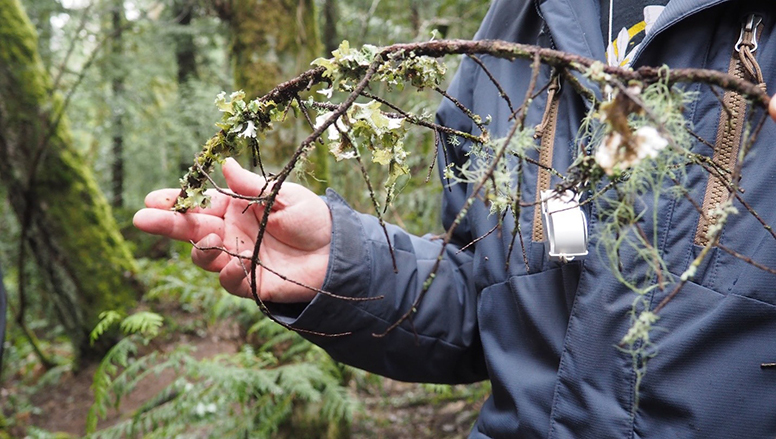 There are more species of lichen in BC than there are species of vascular plants – MacKinnon tells us that nearby Albert Head, little-used DND land which is publicly off-limits and therefore uniquely undeveloped, is thought to contain the highest lichen species richness in the world. Lichen, he says, are like “fungi that have discovered agriculture” – a partnership between algae, or cyanobacterium, living amongst the filaments of a fungus. Biologists have long marvelled at the uniqueness of three distinct kingdoms living together in this kind of symbiosis. But reality may be stranger still: recently, a young lichenologist named Toby Spribille found that in addition to the known ascomycete fungus, lichens are often comprised of a second fungal component as well, a basidiomycete yeast, upending decades of conventional thought on the subject. 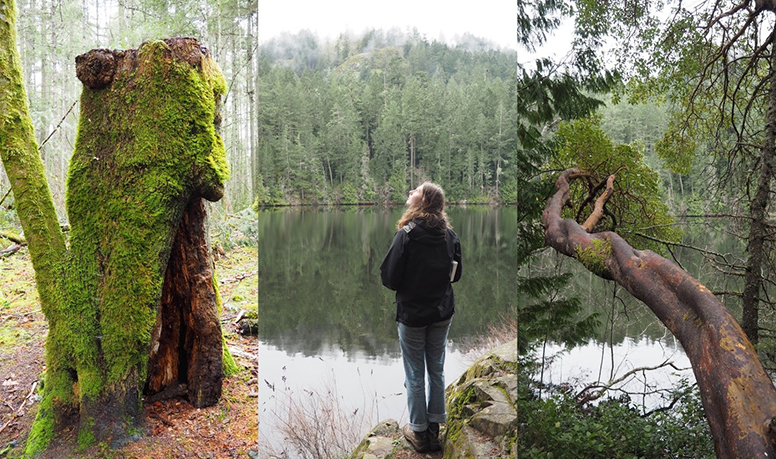 (L-R): A moss-covered stump, looking bug-eyed; overlooking Matheson Lake, Metchosin; the twisting limb of an Arbutus menziesii. We move into the forest and soon spot some small decomposer fungus sprouting from the forest bottom. MacKinnon stoops and delicately examines the specimens with a hand lens. As he straightens, Piper, sensing an opening, vaults forward and eviscerates the mushrooms with the sort of unbridled glee usually reserved for chew toys. Holding a specimen from 100 Acre Wood in Metchosin. The gills on the underside of the mushroom cap, called lamellae, increase the surface area available for spore production. But these days, worries and prudishness seem to have abated as the powerful health benefits of mushrooms are being increasingly acknowledged. Whenever I pass through the herbal dispensary at the downtown Pacific Rim College campus, I look at the long shelves of mushroom blends: reishi, lion’s mane, chaga, cordyceps. 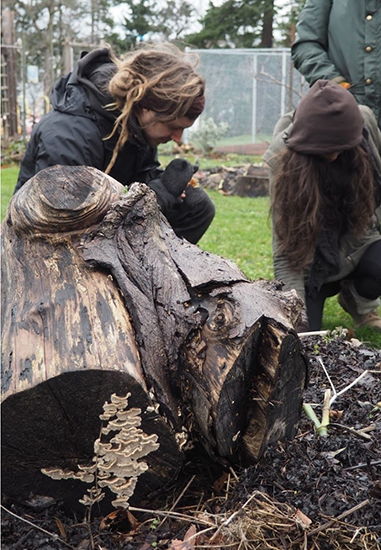 In a permaculture context, mushrooms can serve as valuable myco-remediators, helping to remove toxins from the soil. Some species are good for companion planting, or a crucial component of a forest garden; others can be grown on inoculated logs or in a simple substrate, for both food and medicinal purposes. Nearing the end of our walk, we approach a grand-looking Thuja plicata, the western red cedar. A member of the Cupressaceae family, the trees are not actually true cedars at all, and the fungi that form mycorrhizae with their roots don’t fruit mushrooms. 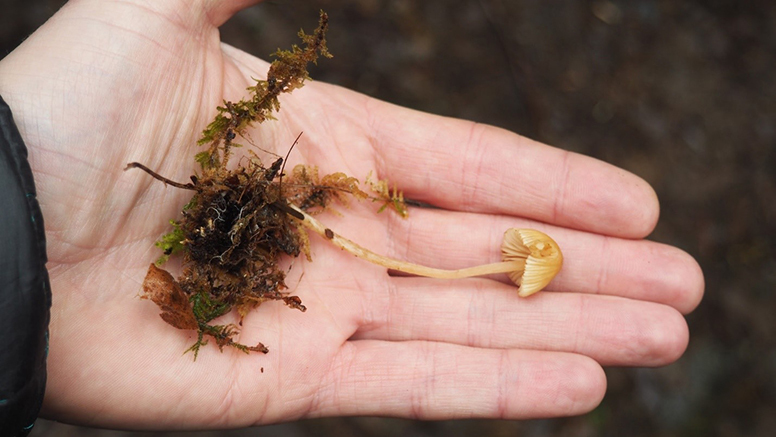 MacKinnon explains that we are therefore unlikely to find any mushrooms nearby – but that ectomycorrhizal fungus, the sort that produces truffles, is probably in the area. We turn expectantly towards Piper, who is a few feet away, but he is vigorously chasing his tail and does not seem concerned with this information. And so we walk on. *Not actually a truffle hound. Words and photos by Dylan Roberts, a student of the Permaculture Design and Resilient Ecosystems Diploma at Pacific Rim College. February has arrived and with it, thoughts of the glorious springtime on the horizon. 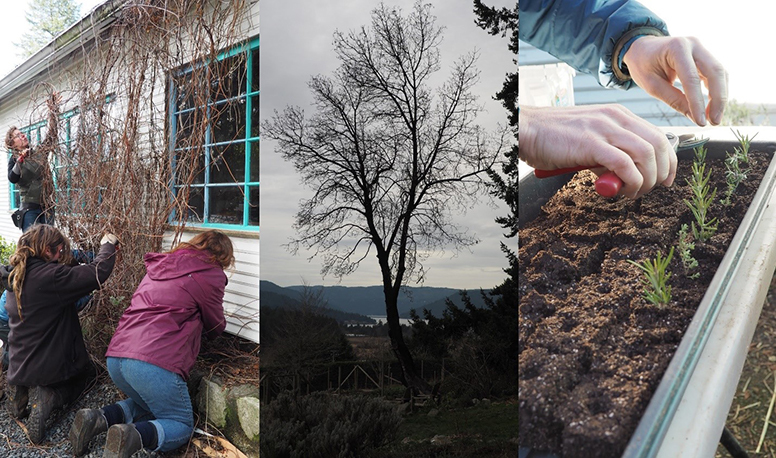 As the bulbs and buds sprout into action, we too may begin to shift away from winter dormancy and awaken to the possibilities and exciting challenges the next season will offer. Following the slowness of winter, movement, flow, and transformation can be encouraged with the help of some herbal allies. February can be a time to focus on the heart, our rhythmic and energetic center responsible for the flow of blood and life force throughout the body. The herbs selected for this blend all influence the function of the heart and cardiovascular system physically and energetically. 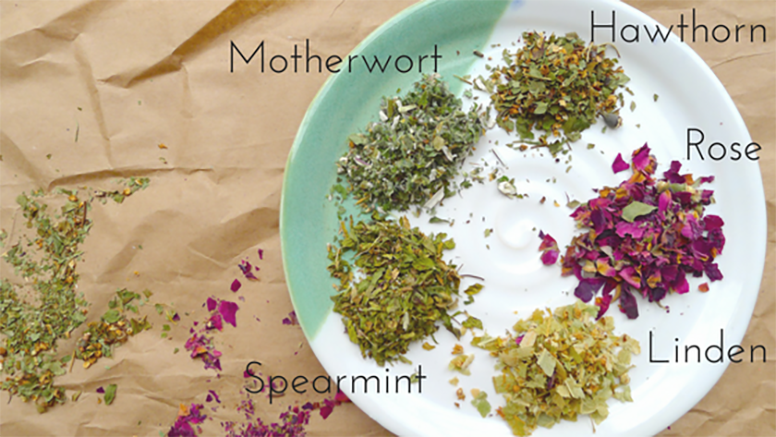 Providing a variety of flavours and medicinal constituents, these herbs work synergistically to make for a tasty, cardio tonic tea. Hawthorn (Crataegus laevigata) belongs to the rose family and offers medicine in the form of berries, leaves and flowers. Chosen for this tea are the leaves and flowers that contain flavonoids to increase coronary blood flow and support the function of the heart, regulating heart beat. Rose (Rosa spp.) is beautiful, nourishing, and aromatic. The soft petals act against stress and anxiety while reliving congestion and stagnation of blood and negative energy in the body. Linden (Tilia europaea) is a large deciduous tree adorned with flowers and leaves used for vasodilatation and for managing stress and nervous tension. This herb is used preventatively for arteriosclerosis and hypertension. Spearmint (Mentha spicata) is high in essential oils which provide an uplifting, fresh flavour. This herb acts as a blood mover, relaxant to the digestive system, and cognitive enhancer. Motherwort (Leonurus cardiaca) belongs to the mint family and has a pleasantly bitter taste in small doses. This cardio tonic herb is an antispasmodic, circulatory stimulant, and can be used to regulate blood pressure. Measure out equal parts of each dried herb and mix well. The amount will depend on how much tea you want to make. You can start out with 5g of each herb which will give you enough tea for approximately 25 cups. To enjoy, pour boiling water over 1 tsp of the tea blend, cover the cup, and let it sit for 10 minutes. “Crataegus oxygantha Monograph.” Handout. Pacific Rim College. Victoria, British Columbia. “Mentha pipertita Monograph.” Handout. Pacific Rim College. Victoria, British Columbia. “Tilia europaea Monograph.” Handout. Pacific Rim College. Victoria, British Columbia. Wood, Matthew. (2008). The Earthwise Herbal. Berkeley, California: North Atlantic Books. Photography and text by Liza Couse who is currently enrolled in the Diploma of Phytotherapy program. Our February Newsletter is out! Please click here to read. If you want to sign up, please enter your email in the ‘Join our newsletter’ at the bottom of any webpage. Pedalling through the Saanich Peninsula, to the north of Victoria, can sometimes bring the feeling one’s been pitched into a verdant dream. Now in its wet winter, lazy rolling slopes are transformed into blankets of fern; trees bowing overhead possess an air of the ancients, lichen dripping from their boughs; protruding rock faces are moss-kissed goodnight. Our two main learning sites, Ravenhill Herb Farm and Tiny Tree Herb Farm, are located here on the peninsula, and my sense of wonder at the teeming life of the place often comes on these bike rides to class. 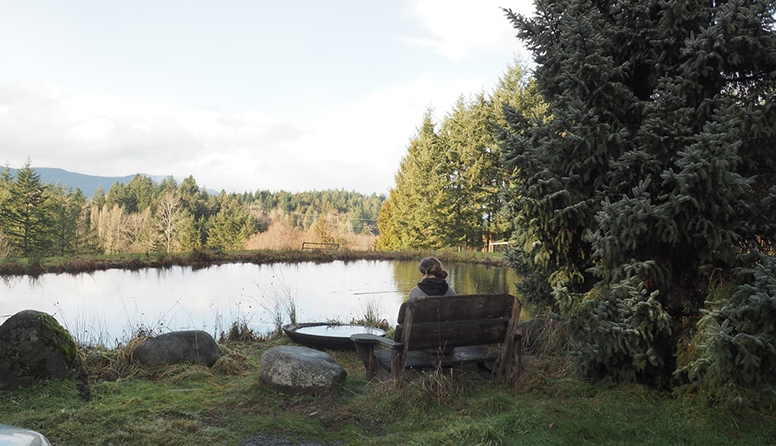 The morning vista from the pond at Tiny Tree Herb Farm in Saanich. Experiencing such lush rural magic, one could almost be forgiven for wanting to pull up stakes in search of their own Walden Pond. But what about the city? I live in one. Somewhere around 80% of other Canadians do, too (particularly in city suburbs, a phenomenon that Statistics Canada calls “urban spread”). Accelerating urbanization has been one of the defining trends of the 21st century, and also a “massive, unplanned experiment” – potent and messy, singularly human, with a feeling of improvisation about it that is at once both exhilarating and scary. 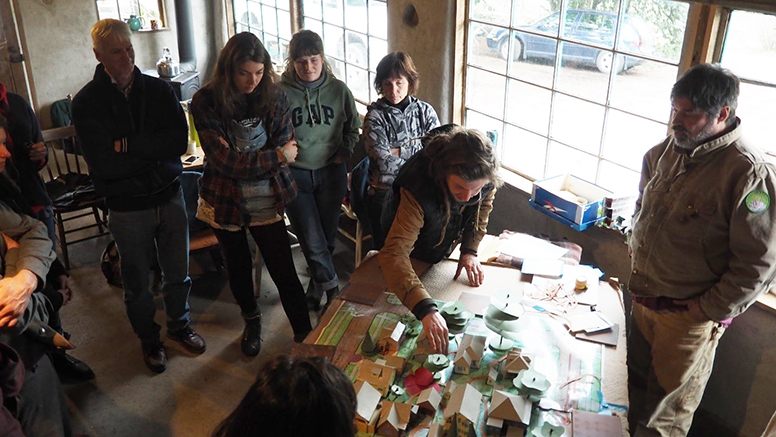 So, what can permaculture offer in the urban context? 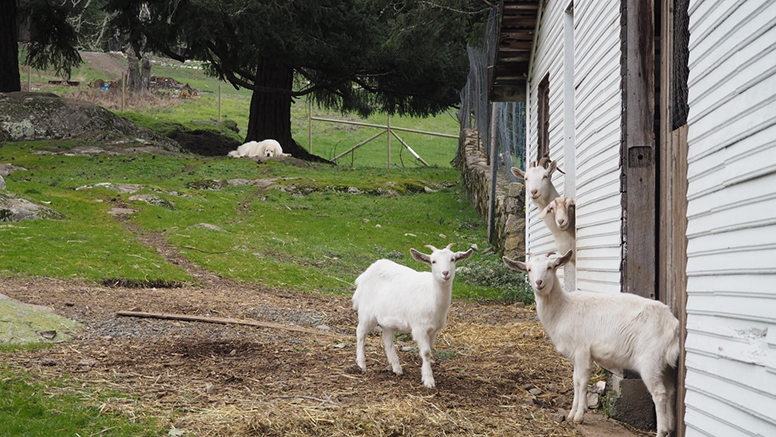 This week, we spent a day exploring some of Victoria’s key sites of urban agriculture. In pondering this question at the start of the day, what sprang to mind for me was the project of reclaiming (so-called) ‘marginal’ land – that which is thought to be tired or polluted or otherwise undesirable, quietly abundant in the crooks and creases of the city. This is work that demands energy, patience, and creativity, and I easily imagine the potential for dynamic, healing change realized through a permaculture approach. 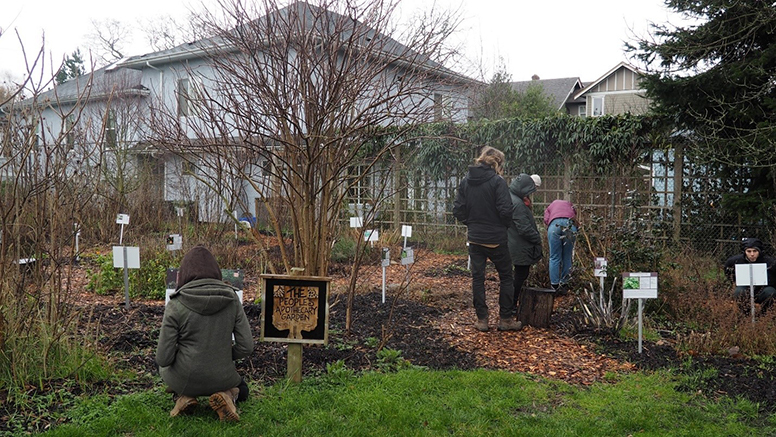 The People’s Apothecary Garden, another stop on our urban permaculture tour, is a herbal commons focused on medicinal plants. A core principle of the garden is “decentralizing medicine”, a vision for community-based healing with plants. 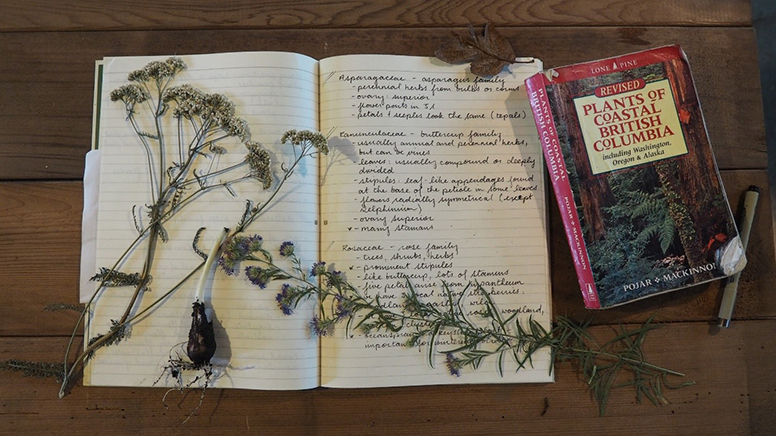 These principles and knowledge are explored in-depth at the School of Western Herbal Medicine at Pacific Rim College. As the day progressed, though, I was struck most of all by the sense of community building that informed the design and imbued the spirit of the places we visited. It seemed a vital example of the permaculture maxim “the problem is the solution” – the same urban density that can pose such a challenge for productive growing, here harnessed instead in the service of close and fiercely creative agricultural collaboration. In some ways it seems that it is here in the cities that a good part of the latent political energy and social potential of permaculture resides. And this shift turns on the idea that we don’t need to wholly cede our relationship with what we eat to the distance and scale of large rural production. We began our morning at a permaculture food forest in the Vic West neighbourhood, the scraping chairs and laughter of the nearby Spiral Café still in earshot from where we stood at the fringe of the trees. Banfield Commons exists for public harvest, thriving under the care of a “food security steward” and volunteers from throughout the neighbourhood. A cob bench at the entrance reads “Sustenance for all,” the faithful tending of the place seeming to belie, at least in this modest instance, Garrett Hardin’s theory of the tragedy of the commons. 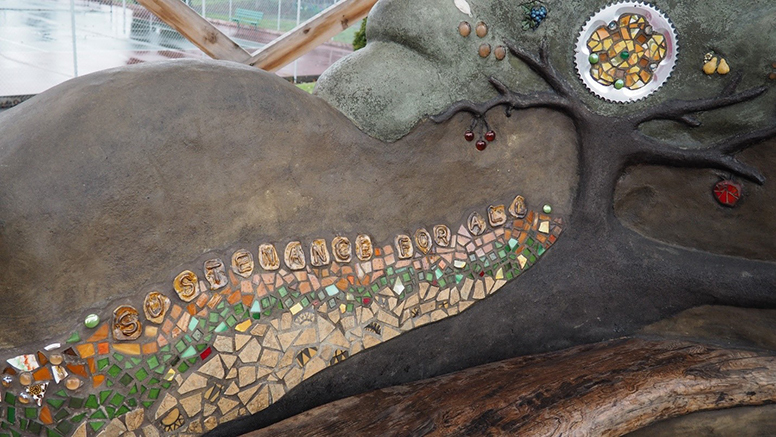 A cob bench at the Banfield Commons in Vic West. Note the repurposed bicycle chainring aloft in the tree. Next door is the Banfield Community Orchard, commissioned in 2013 and designed through a process of community consultation by a local company, Hatchet & Seed Edible Landscapes. The orchard employs hugelkultur (“hill culture”) building technique, a kind of raised bed growing that mimics nature by using debris wood – a felled tree, say – both for the structure of the bed and as the biomass for growth. Here the decaying wood provides nutrients to the fruit and nut trees growing on top, and also creates a rich environment for vital bacteria, fungi, and mycorrhizae development in the soil. Nearby in the orchard was an inoculated log dotted with mushroom growth. 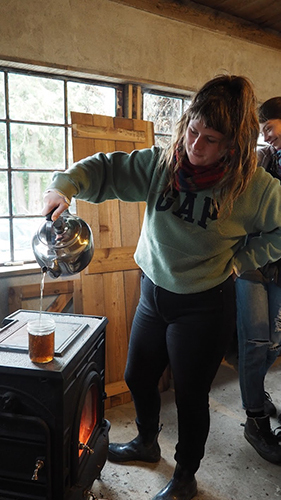 Our instructor, Hannah, talked about the role of mycelial networks in supporting self-sustaining growth. Narrow threads that make up the bodies of mushrooms, known as the mycelium, tap into nearby plant roots in an exchange of food and nutrients. But these mycelial networks also function as a kind of subterranean internet, connecting these plant roots to other plants as well. Mature trees can assist younger ones by passing over nitrogen and phosphorus; diseased plants have been shown to send out warning signals along their mycelial networks that prompt neighbours to proactively mount their chemical defenses. Growth on a log at the Banfield Community Orchard. After lunch, we walked over to Mason Street Farm, a scruffy jewel of the nearby North Park neighbourhood. Situated on just a quarter acre, hemmed in by proudly fading houses and in the looming shadow of a condo development, the farm has been in continuous operation for 25 years. It’s long been a hub of activism, too: in his living room in an adjacent house, director Jessie Brown recounts the push the farm made in the mid-‘90s to have Victoria enact what was, at the time, one of the first municipal bylaws in North America permitting backyard chickens. Towering stalks of kale at Mason Street Farm, in Victoria. The social capital doesn’t appear to be in short supply. When plans were announced to re-zone the site of a former school behind the farm to make way for a large development, Brown pushed back, explaining that the new structure would shade out large parts of the farm. The neighbourhood rallied, sending hundreds to speak in support of the farm in a series of public hearings about the development that stretched on for years. In spite of this, the plan was eventually approved by City Hall, and Brown now strikes a pragmatic tone in discussing how permaculture principles will steer the practices needed to deal with this new operational reality. 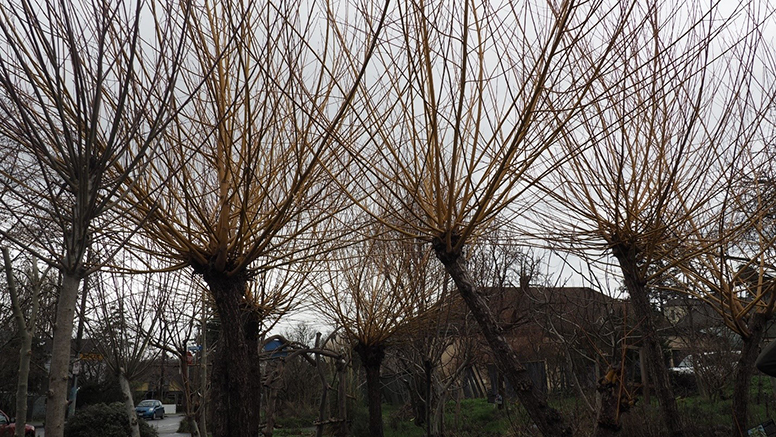 An example of pollarded willows at Spring Ridge Commons, in the Fernwood neighbourhood of Victoria. Pollarding is a pruning technique traditionally employed for timber production, but here it is used to keep the trees at a fixed height and to encourage dense foliage. Spring Ridge Commons was formerly a disused parking lot, now reclaimed by sheet mulching. No stranger to obstacles over the years, Mason Street Farm continues to work as an example of the viability of small-scale urban farming. In answer to the challenges of cities – sometimes fraying communities, red tape, the politics of development – this farm and the other sites from the day share a vibrancy and an energy of purpose that feels uniquely urban and which contains great promise. Here I am: hunched over the classroom table, squinting intently through a hand lens like some rubber-booted horologist. Feeling vaguely aristocratic with this new implement, I test my eye muscles to see whether I can hold the lens hands-free, like a monocle. In my imagination, I wear both personas at once: an aristocrat watchmaker, an antiquarian horologist, John B. Macklemore muttering in his Alabama cabin over the guts of an eighteenth-century clock. 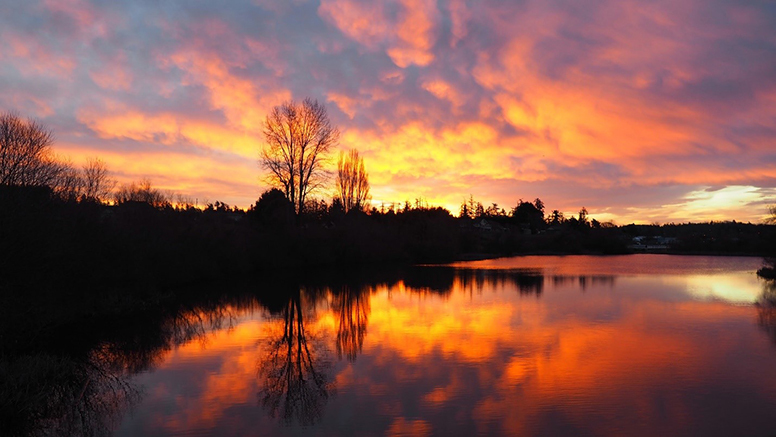 Sunrise over Blenkinsop Lake, on the bike ride to class at Ravenhill Herb Farm. But instead of bezels and hairsprings and balance wheels, I’m looking at pistils and anthers and ovary positions (is the ovary epigynous, perigynous, or hypogynous?). This is our first botany class. These are the names of plant parts, and working to absorb this flood of terminology is like learning a new language. Biologist Kristen Miskelly is teaching the course at Ravenhill Herb Farm, and later in the day we hike up the side of ȽÁU,WELṈEW̱ (meaning “place of refuge” in the indigenous Sencoten language, and called Mount Newton in English), she points out native plants and grasses along our path. I’m struck by how she identifies them all with an easy glance: deciphering this verdant landscape thick with vegetation, indigenous plants cheek-and-jowl with introduced species in a vast tangle of life. She lists their scientific names in a rhythmic beat of Latin syllables. 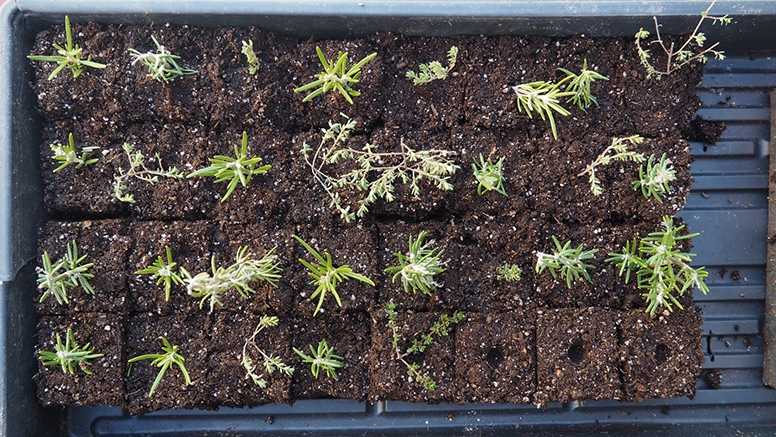 From left to right: Achillea millefolium (yarrow); yarrow root; Symphyotrichum subspicatum (Douglas’ aster). Yarrow has a long history of food and medicinal use among Indigenous nations including the Nlaka’pamux, Tsimshian, Ulkatcho First Nation, and Nuxalk Nation. We pass fire-scarred Douglas fir trees, whose thick insulating bark protects the living inner cambium from heat injury. Miskelly explains that traditionally, tracts of this land were set afire in controlled burns to renew growth and clear brush. Tough, fire-resistant Douglas firs could withstand these burns, while competing trees could not. The open forest canopy allowed firs and other sun-loving trees like the Garry oak to flourish. In recent decades, fire monitoring and provincial bans on controlled fires have led to increased forest density, and skinny, shade tolerant competition has dimmed the canopy and begun to choke out firs and oaks. 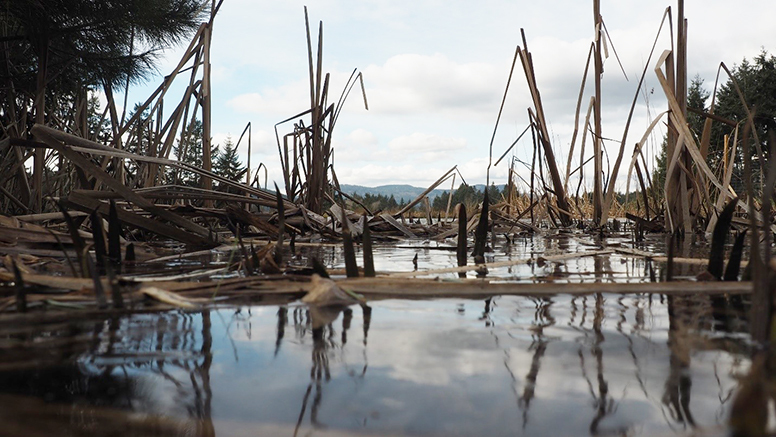 These and other cascading ecological changes are deeply felt: fully 20% of plants listed in the federal Species At Risk Act are found in the Victoria area. I think about how much different a landscape must look to the eyes of someone who can confidently identify its flora – the attitudes and relationships of these plants, a story etched into every latent bud and every crooked branch searching upwards for a slanting ray of sunlight. It is a constant, subtle dance, and it must offer a compelling story for an engaged botanist. Miskelly, though, reading my mind, notes that there are differing strains of thought in botany about teaching by naming and categorizing. Some argue that doing so can serve to reduce a plant to its name: a glimpse of a craggy bough allows identification as Quercus garryana, the Garry oak, but the practiced efficiency of such an eye can bring with it a host of assumptions and miss the singular personality of the specimen. I’m reminded of the Zen Buddhist notion of Shoshin (“beginner’s mind”), and, since my botanical mind is entirely a beginner’s, I try to feel grateful for my childlike ignorance and enjoy the magic of wonder and curiosity untethered from expectation. 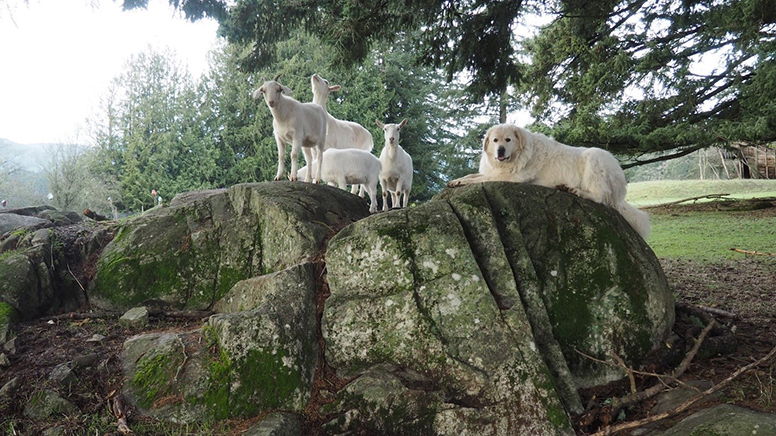 Curious goats, employing “beginner’s mind”, take their vantage point to examine a student interloper. 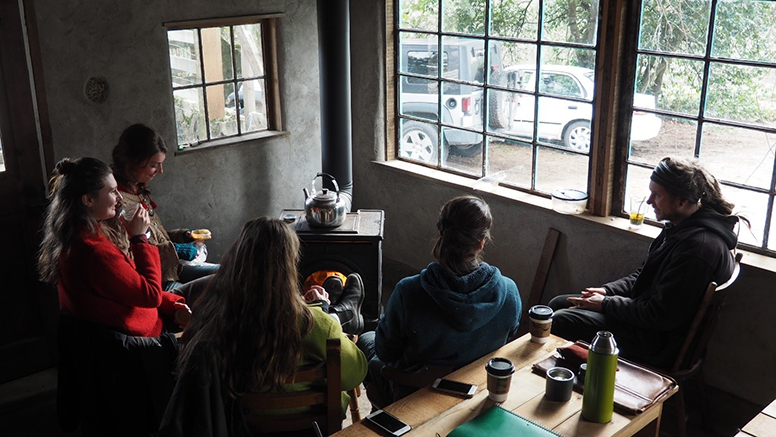 Curious observation makes up the core of another ongoing exercise that we’re doing in our Introduction to Permaculture course: a daily sit. We’ve all picked an individual spot at the farm for close and gentle examination whenever we have class. That the program is a year in length means we’ll monitor seasonal shifts as well as the minutiae of daily change. Permaculture teachings suggest people wait and observe for a year, if possible, before beginning to make adjustments to a new landscape. Part of the reason is straightforward prudence – the better one understands the land, the less likely one is to waste energy and effort when working with it. There is a meditative quality to this idea, too, that trying to better align one’s internal rhythms with the rhythms of the earth can be a contemporary act. It’s possible. And so that’s the goal here, in a small way: to come to know this spot, in a way that functions almost below the level of thought. Nikki getting tea going in the classroom. Of course, this might not always be a realistic practice. And its insistence on stretching time past its short-term horizons sits uneasily with the imperatives of modern capitalism. But it is worth thinking on. In class we picked through a deck of “core concept cards” which detail some of the primary principles and ethics of permaculture. One card listed redundancy – clearly an important thing from a practical point of view, as using multiple methods to “back up” core functions in your project ensures that an isolated failure won’t disrupt the whole system (ie. rain barrels are good, but you’re wise to also have a long hose). This card indicates a different way though: “The goal of permaculture is to make yourself redundant. To share everything and help mentor others to share in the work with you, and continue it after you are gone.” Self-redundancy – there are echoes here of the Iroquois philosophy of seven generation stewardship, that we should think and work with an eye seven generations into the future. That we should cast the net wide, doing that tricky work of centering others in our approach to life. Patient, curious observation would seem to make a good ally in this project. 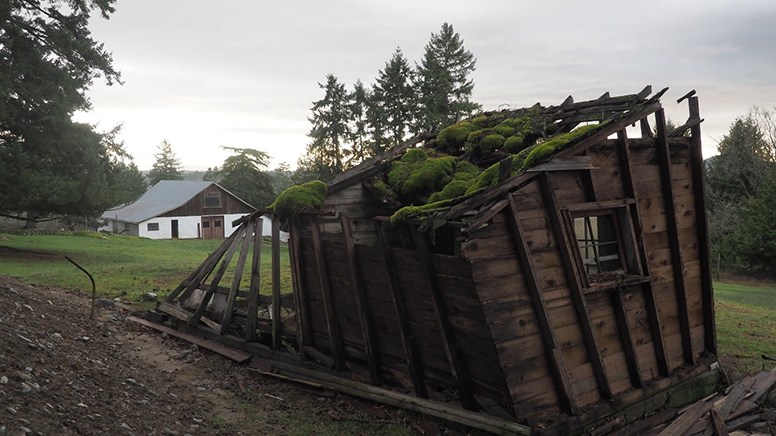 Elegant decay: moss covers the roof of an outbuilding at Ravenhill Herb Farm. Anyway, I’ll close with a few simple observations about my sit spot. This will no doubt change as the year goes on and I find the vocabulary to better describe what I see. But in the meantime, indulge my beginner’s mind. I’m on a furrow in front of a bent sapling, spindly needles in laurel green and brown giving way suddenly to long, wild needles nearer the top. The ground is sloped and pockmarked with dull, jutting stalks like a post-harvest stubble. Two thick bunches of grass flank the sapling, and clover and moss are abundant, tiny and intricate, sat straight on top of the soil. Thirteen rocks in a rough line sit just to the east, impassive.